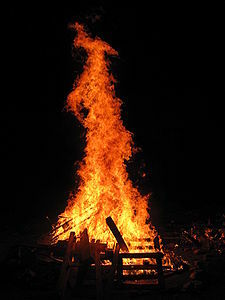 Lag BaOmer (Hebrew: ל״ג בעומר‎), also known as Lag LaOmer amongst Sephardi Jews, is a Jewish holiday celebrated on the thirty-third day of the Counting of the Omer, which occurs on the 18th day of the Hebrew month of Iyar. According to the Talmud and Midrash, this day marks the hillula (anniversary of death) of Rabbi Shimon bar Yochai, a Mishnaic sage and leading disciple of Rabbi Akiva in the 2nd century. Modern Jewish tradition links the holiday to the Bar Kokhba Revolt against the Roman Empire (132-135 CE). In Israel, Lag BaOmer is celebrated as a symbol for the fighting Jewish spirit.